Lounging on the beach on Capri is not always an easy endeavor. There are no endless stretches of soft sand inviting you to take long walks or spread out a towel on this island famed for its craggy coastline. 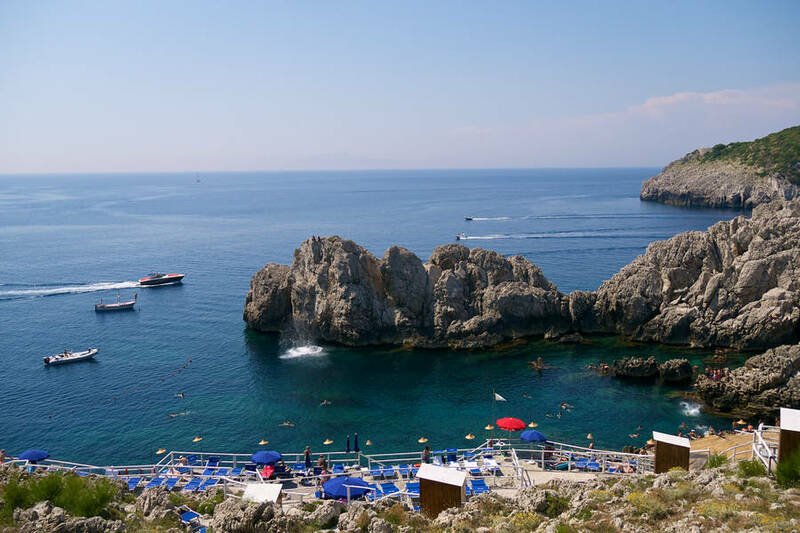 The seafront here is marked by tiny coves lined with pebbles, boulders, and steep cliffs from which you can dive directly into the Mediterranean. To reach the water's edge, you often have to descend steep flights of steps or walking trails through the wild countryside (which you will then have to climb back up after your swim!). 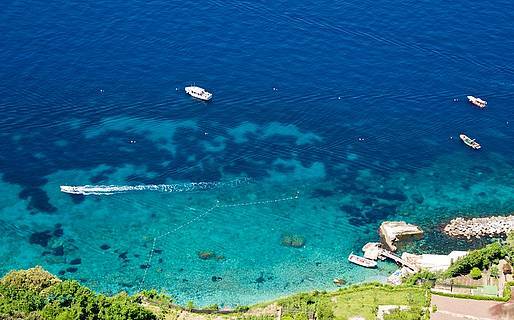 That said, the reward is worth the effort: crystalline waters so clear you can see straight down to the sea floor. The average price for entrance and a sun lounger at a private beach establishment is between EUR 20 and 25 a day, plus around EUR 5 if you would prefer to have a beach umbrella. There is usually a stretch of free beach near each beach establishment if you have brought your own chairs and umbrellas. 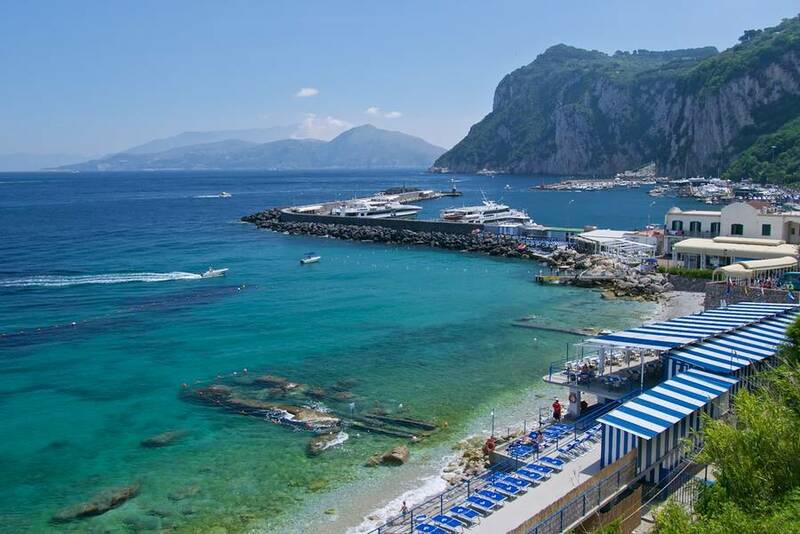 For a full day at the beach, including lunch at the seaside restaurant and a few beverages, you should probably budget between EUR 80 and EUR 120 per person. 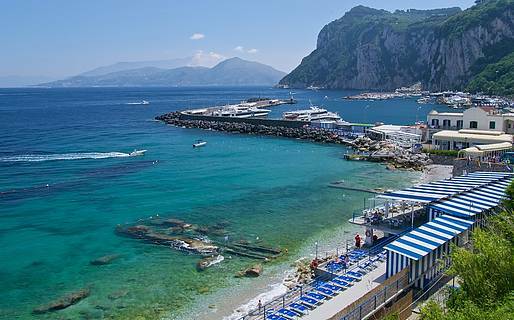 As soon as you arrive at the port on Capri, you will see the Marina Grande beach just after the pier where the high speed ferries from the mainland dock. This is the largest beach on the island, and despite being so close to the port, the water is crystal clear. This beach is especially suitable for children, and is the most popular beach for families with young children living on or visiting the island. 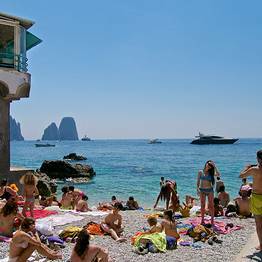 The free beach here is just after the ticket office for the high speed ferries, which is where boats for the Bagni di Tiberio depart, as well. 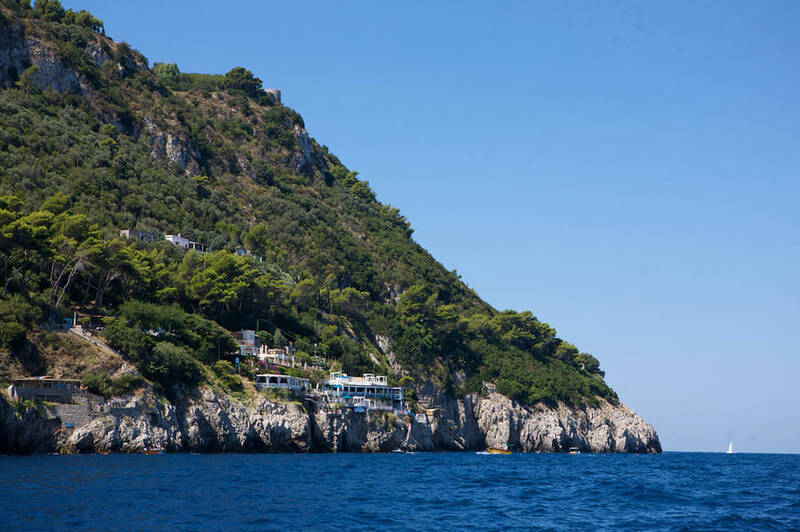 The Palazzo a Mare beach is on the Marina Grande side and must be reached by boat, shuttle, or on foot along a route through the area near the Da Paolino restaurant. It is a pebble beach and there is a beach club, a restaurant, and a small stretch of public beach to one side. 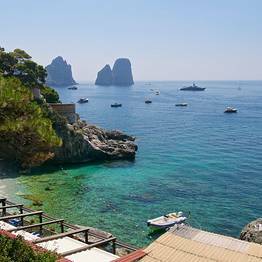 The stretch of coast around Marina Piccola faces the famed Faraglioni di Capri, dramatically towering sea stacks, and is one of the most beautiful spots on Capri for a day at the beach. 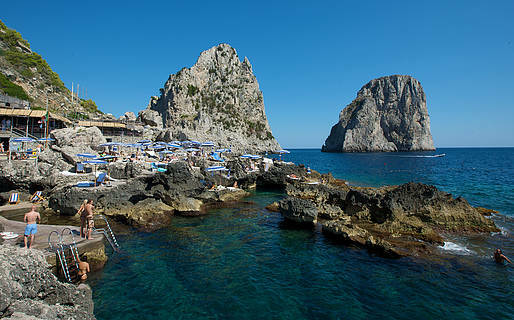 Along with Marina Grande, Marina Piccola is the only place on Capri where there are real stretches of beach. 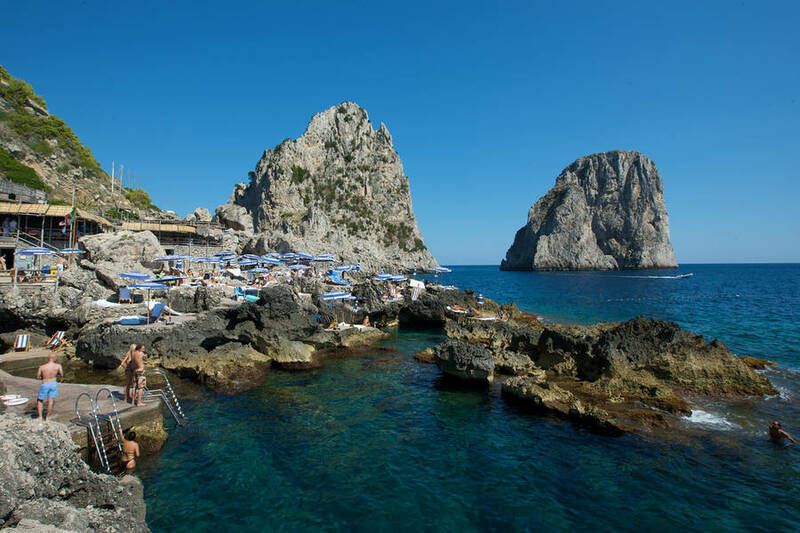 The bay at Marina Piccola has southern exposure and is protected by Mount Solaro, so it is always warm and still; you can find local islanders taking a dip here even during the winter months! The only downside to this pretty cove is that the sun sets early here, so if you want to spend the entire day sunbathing you need to arrive in the morning. 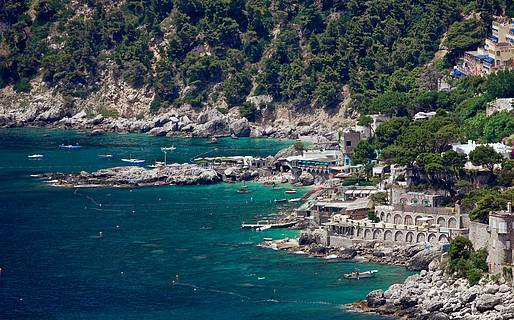 You can reach Marina Piccola by bus or on foot by descending the stairs on Via Mulo (at the end of Via Roma at Due Golfi). 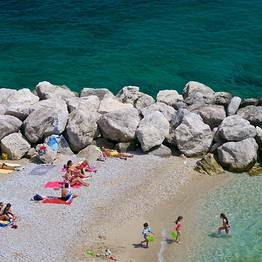 The two stretches of free beach are on either side of the Scoglio delle Sirene beach establishment (you can reach them by descending the stairs from the bus stop at Marina Piccola). 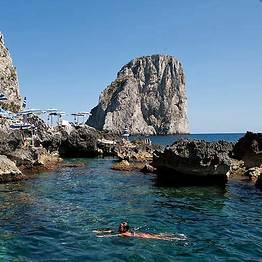 At the foot of the dramatic rock formations which have become the symbol of the island of Capri, the Faraglioni, there are two beach establishments with restaurants. 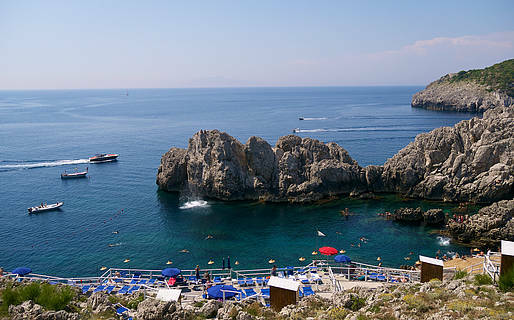 Here, the "beach" is actually a rocky cliff from which swimmers dive directly into the deep water, so this is not a particularly child-friendly beach. 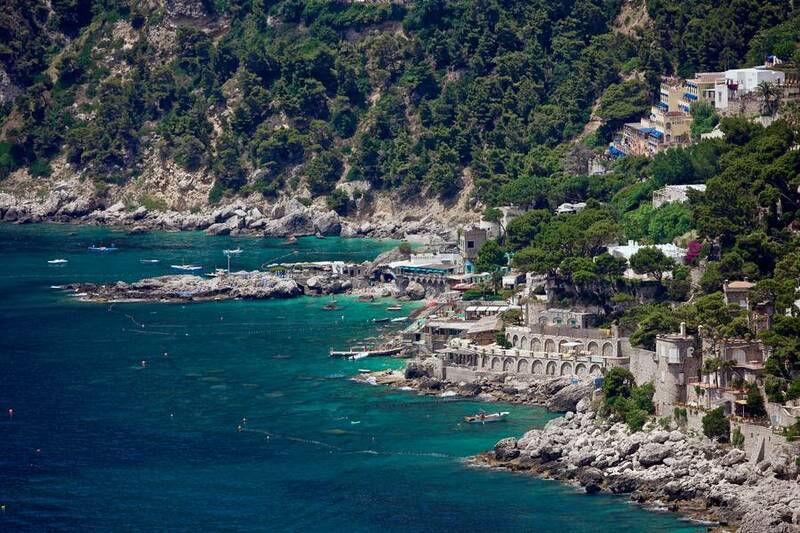 To reach this stretch of coast, follow the footpath from the Punta Tragara scenic overlook, or you can arrive with the boat transfer service that both beach establishments offer to and from Marina Piccola. This is the perfect spot for a long, leisurely day relaxing and enjoying the spectacular view and pristine coast. Given the limited space and high demand for this gorgeous beach, we recommend you book ahead to avoid finding the beach already filled to capacity. 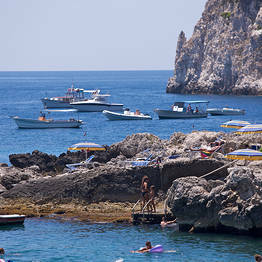 There are a number of beach establishments and a stretch of free beach near the Blue Grotto. 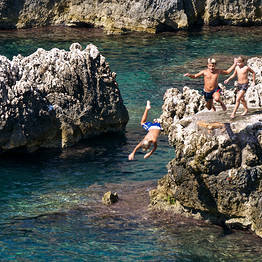 Here, the coast is a rocky cliff from which you dive directly into the water. 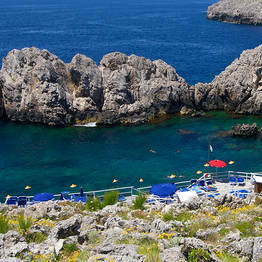 The area near the lighthouse is the most beloved by islanders, both because it is removed from the lion's share of the tourist crush in high season, and because it is the only spot on the island where the gorgeous sunset over the Mediterranean can be enjoyed, cocktail in hand, each evening. Beneath the lighthouse on the rocky shore, there is a private beach establishment with a pool, restaurant, and open area. In the open area, there are two waterfront cafés which also rent out beach chairs.